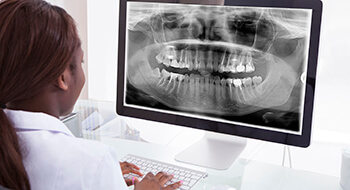 We use digital radiography also known as x-rays to evaluate, assess, diagnose, and plan precise treatments for our dental patients at every age. Dr. Darren Tong and the Smile More Kidz team want patients to know that regular diagnostic x-rays are even more important for our young patients with developing smiles. Unlike traditional x-rays, these digital scans are easy and safe to capture and they can be stored, viewed, and transferred instantly on any computer. 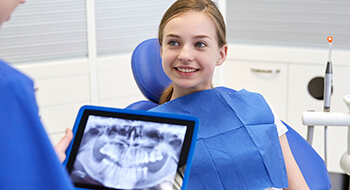 If you’d like to find out more about digital x-rays or it’s time to schedule your child’s next checkup, give our team a call. 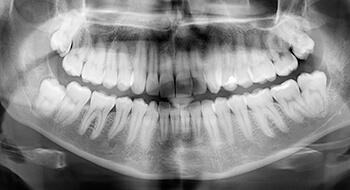 X-rays are an important tool for diagnosing tooth decay, damage and wear at any stage of dental development. Especially when decay or damage occurs between teeth or inside the tooth where a visual examination may not find them. As teeth develop below the gum line, we’re able to track their growth to ensure optimal oral health. We will know right away if your child’s smile has missing or additional teeth, and we can intervene to correct these concerns in the earliest stages. If the jaw or other structures are not developing correctly, x-rays will reveal these developmental concerns so we can provide treatment. We will see teeth that don’t fit together well or that don’t erupt in proper alignment at the earliest stage, so we can begin planning for orthodontic treatments. Capturing and viewing digital x-rays is much simpler than the traditional x-ray process. Early x-rays took several seconds to capture. While this may not be significant for adults, taking a series of scans that require young children to remain still for several seconds at a time can be a challenge. Digital x-rays are much faster to capture. One quick snap and we’re on to the next image. Additionally, the faster digital scans expose your child to significantly less radiation than traditional x-rays. In most cases, digital x-rays use between 40 and 90% less radiation than their traditional counterparts. The images produced by digital x-rays are much clearer, and they can be viewed right away on our chairside computer monitor. Traditional x-rays were developed using hazardous chemicals and had to be viewed on chairside monitors. These large film x-rays also had to be stored and transported manually to specialists, dental labs, and insurance providers. Digital x-rays can be shared at the touch of a button, and are easily compared between appointments, allowing us to offer the most precise diagnosis and treatment planning.